I installed a Doc Wattson into the house battery circuit of my van last weekend. I must emphasize that I have very light electrical demands when camping. Interior lights are LEDs, one fluorescent light under the trough, the fresh water pump, kitchen unit indicator lights, and the stereo and cig. lighter is the total draw on my 31 Ahr AGM aux. battery. 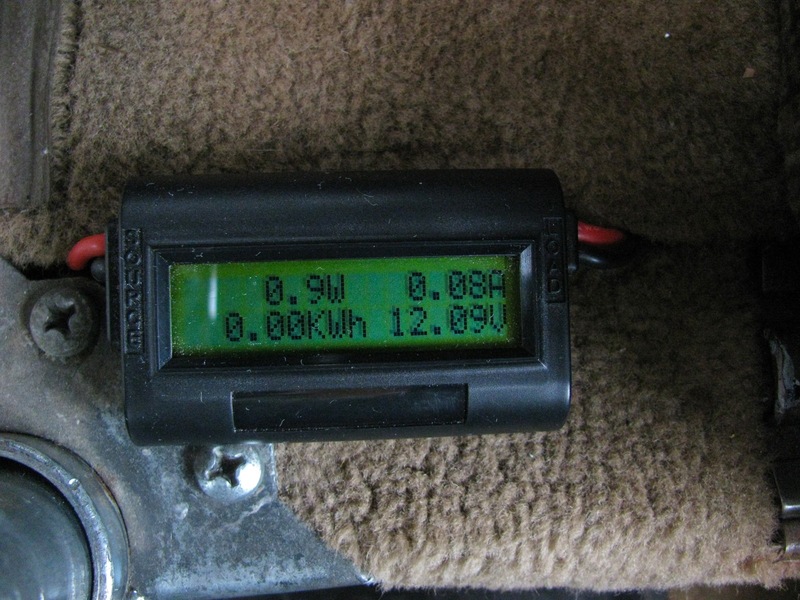 The Doc Wattson acts as a (only one way unfortunately) power meter showing and recording battery voltage, battery lowest voltage, current draw, peak current draw, watts used, and kWh. The connections made are all via short pigtails of 14 g, fine stranded and silicone insulated wires. This small wire would be a concern if the unit was used to measure larger currents (say above 20 A). The black wires on the unit carries the current, and in my install they connected the neg battery post of aux. battery to chassis ground. Any one of the 2 red wires is connected to the positive terminal of the battery. Keeping the wire runs as short as possible the meter ended up just in front of the front table support bracket. That was a very brief outline of the install, more info from the source here. So what did I find out about things electrical these past couple of days? Well I took some pics to show. I reset the gauge before these pics, so kWh and Ahr will be showing zero. Here we are, engine off, stereo has been on but now off, stereo head unit still attached. 80 mA draw eh? That drops to zero when face plate off (or as close to reading zero as the meter resolution allows) BTW, I noticed the kitchen panel indicator draws somewhere between 10 and 20 mA when switched on. Stereo on and playing (have external amp too), volume at camping level. See the peak Amp (Ap) reading? Engine on, both the house and starting batteries have been combined via my Blue Sea System ACR. I have an adjustable voltage reg. on my alternator and it is adjusted a tad high I think. 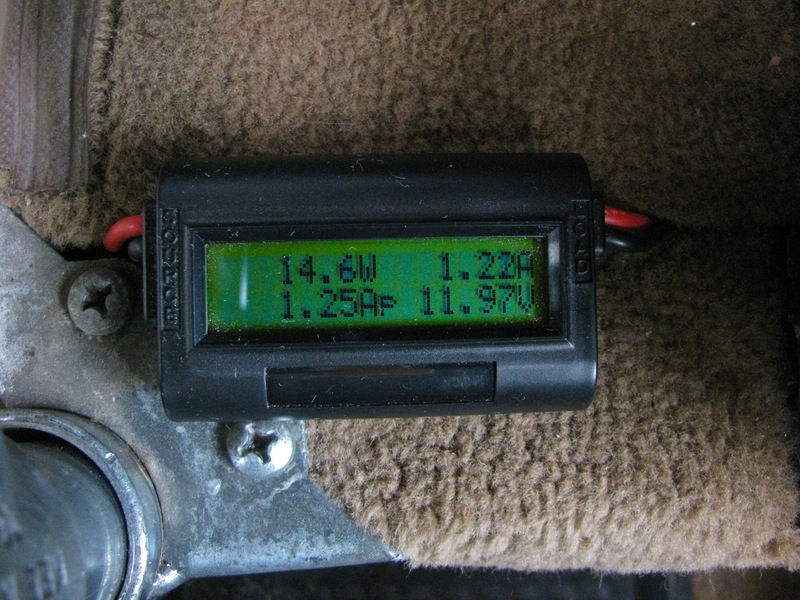 When the 2 batteries are combined the ammeter portion of the meter does not work (the starting batter neg to chassis connection by-passes the meter). But once the ACR separates the batteries when the ign key is off then the stored current and power values are displayed. Pros – inexpensive, easy to install, handy at a glance indication of how much electrical power you are using. Cons – measures current via neg ground path. That means, in a car with the chassis as return path, you can’t (as far as I can tell) measure a particular circuit. 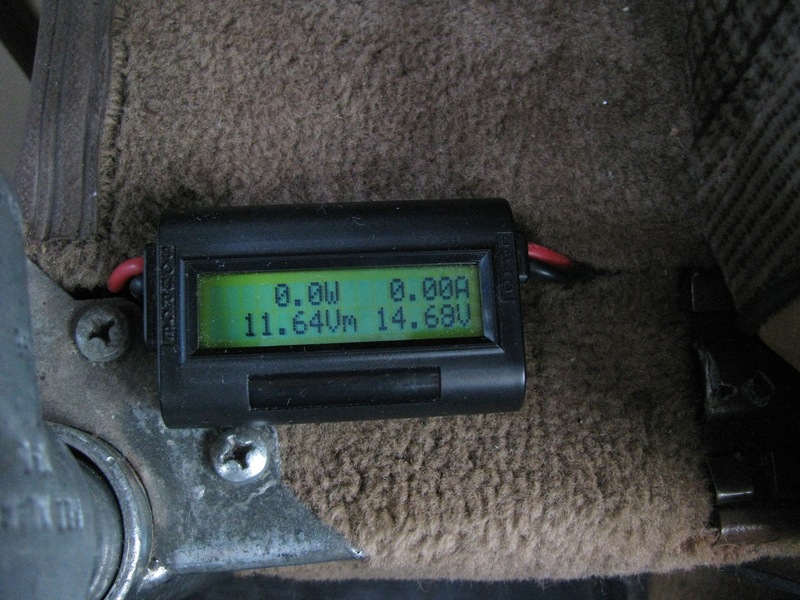 One way measurement – would be neat if when the engine is running and the battery was being charged, the meter would run backwards and show the elimination of the electrical debt you got into. No back light. I’ve got more to say about this meter, and would like to show the install wiring. But I need to get my wiring runs neater before then. This entry was posted on November 20, 2012, 3:46 pm and is filed under vanagon, vanagon mods. You can follow any responses to this entry through RSS 2.0. You can leave a response, or trackback from your own site. Very cool, I’ve been thinking about installing a system for measuring electrical status. I’ll look for a “Doc Watson” system or something comparable. I have the standard set up that came with the 85 weekender rig. One relay between the house battery and the starter battery. You mention above that you combined your battery’s using a “Blue Sea system”, I’m not familiar with that system. What is your rational for combining? Hold off on the Doc Wattson for a while, I’ll be posting more in the install and it might affect your decision. The Blue Sea System ACR (Yandina makes similar) is nothing but a fancy relay. The fancy part is that it connects and disconnects the batteries based on user definable voltages. So for example, when I switch engine off, a regularly relayed house and starting battery system would have the 2 batteries disconnected from each other immediately. The ACR waits until both batteries reach a (user defined) voltage level before separating them. I have mine set at 12.5 or so. Similarly, the batteries will not be recombined upon start up until main battery reaches a user defined voltage. This added bit of control has advantages, I should probably write a post on them.